HONESTLY, IS HONESTY THE BEST POLICY? I just read a wonderfully insightful article at Helium.com on being honest. The gist of the article was about what it means to be honest not just with others, but with yourself. The writer, Carolyn Gwiazdzinski, hits it on the head when she asks the question “How many of us have considered if we are comfortable with being honest within ourselves and we didn’t shy away from the challenges that come from this kind of honesty, wouldn’t it stand to reason that our relationships would have a stronger foundation and connection within ourselves and each other? True authentic honesty insures that it is not necessary to hide from ourselves and each other.” To me, that means facing the difficult discussions myself and not hiding behind others or letting others speak for me. It also means owning my feelings and letting others know how their actions made me feel. Naturally, to get along in this material world sometimes it’s best to pick and choose which conversations are vital to your authenticity. And, a dose of kindness and tact is required. Otherwise, you could be spewing feelings all day long. And who needs that?! Since I practice BHS Tibetan Buddhist Feng Shui, I am interested in all things Tibetan. 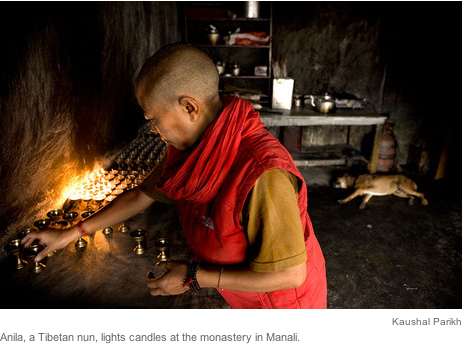 There is a marvelous slide show of a day in the life of a Tibetan monk over at the NPR blog taken by Kaushal Parikh. The visuals are stunning (see that bright yellow door!) and the essay informative. In the picture below, you can see a sleeping dog. He reminds me of our dog Hershey who has very meditative qualities about him. I knew that the new monks of Skete kept dogs (we trained our dogs by their books) but I didn’t realize Tibetan monasteries kept dogs, too. I encourage you to visit the NPR site and thank you to Kaushal Parikh for bringing us this wonderful photo essay. 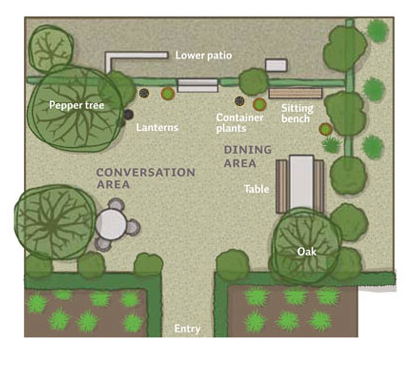 A plan for a Tuscan Dining area, outside! I love the idea of taking outdoor space and making it actually an extension of living space. If you have acreage–or if you cleverly use what you have–you can substantially expand your square footage of living area. The layout shown above has a good balance of yin-yang shapes (round feminine vs. square masculine). See how many circles and squares you can find. Then go look at Sunset Magazine for more images of this beautiful garden space. In contrast, above is a photo recently featured in a house tour on Dwell.com (“Double Time“). I liked much of the house until I got to the back door and outdoor space. What a perfect opportunity for the designers to incorporate a little feng shui balance. For example, the window in the upper right hand corner of the photo could have easily have been a round one. Or, the terrace stones could have had rounded yin shapes instead of echoing all of the squares and grids (a very tired trend). What else doesn’t feel right? The step down and the fact that it is all grass. I’ll bet that back space would be utilized a lot more if the upper terrace under the roof was a solid floor (either decking, stonework, or concrete) instead of grass. What more perfect area for an outdoor living space than one like this—opportunity squandered. Do you agree? 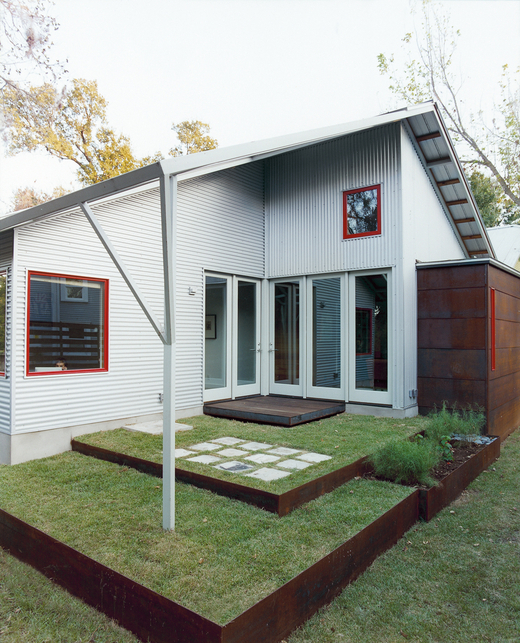 Check out the rest of the pictures at Dwell. A nice balance of feng shui elements. I like the use of wood, earth (slate tiles), fire (hot pink tablecloth) and I’m hoping they have some metal and some water feature that is off camera. 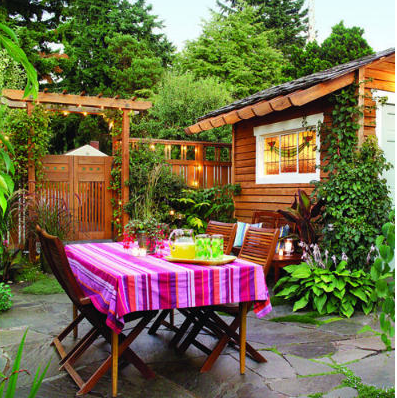 This is another patio example seen at Sunset Magazine. I also want to point out the wonderful use of vines crawling up the corner of the house. This is a great example of using plants to eliminate/solve/cure a feng shui problem known as a knife edge. All corners jutting outward create knife edges. It’s not a problem unless you plan to sit or sleep in front of one. This one was completely neutralized by the rounded leaved plants growing up and concealing it. Artist colleague Ron King’s work was selected by Martha Stewart’s Blog in a feature she did about the Maine Crafts Guild Show. Ron and I both show our art work at the Red Dot Gallery in Deer Isle, Maine. 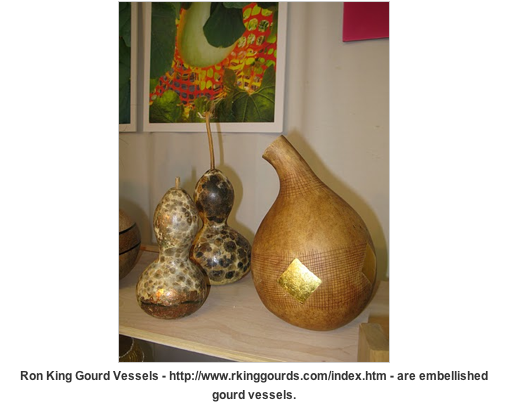 The gourds are grown on Ron’s farm, then dried and hollowed out, and embellished in various ways by hand. 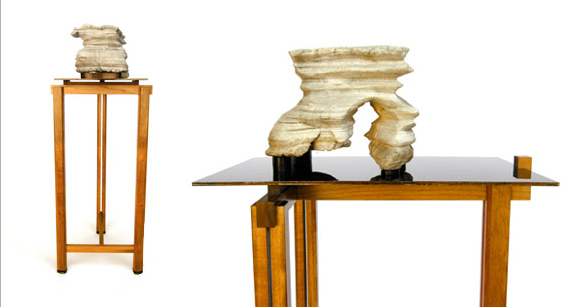 They have almost a Native American or African flavor to them and are very good feng shui. Check out the website links!